companies to aid in the creation of the #Brunchweek recipes. All opinions are mine alone. 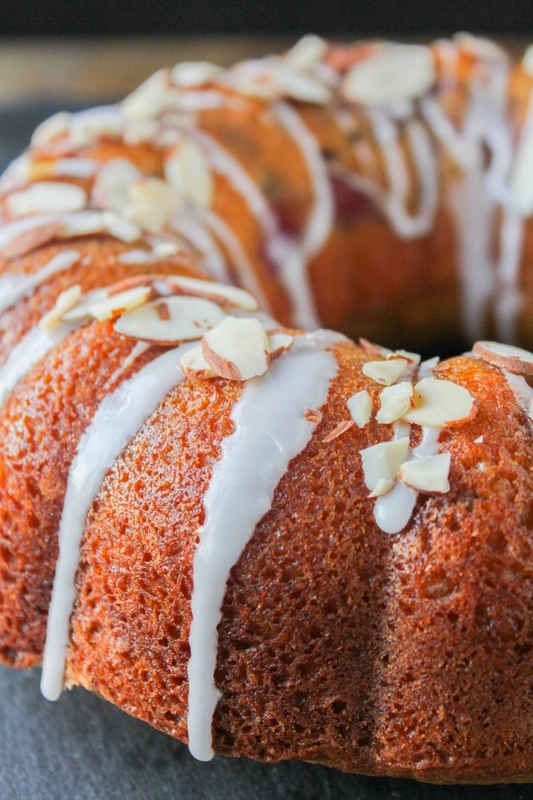 extract, and slivered almonds, this delicious cake will quickly become a family favorite! I'm gonna be honest here, coffee cake is my weakness. I would make one every few days if I could, but I don't because I know I'll devour it all by myself. Coffee cakes are one of those things that are good for breakfast, brunch, an afternoon snack, and even dessert. I can eat coffee cake all. the. time. See the problem here? I need to learn to control myself better. 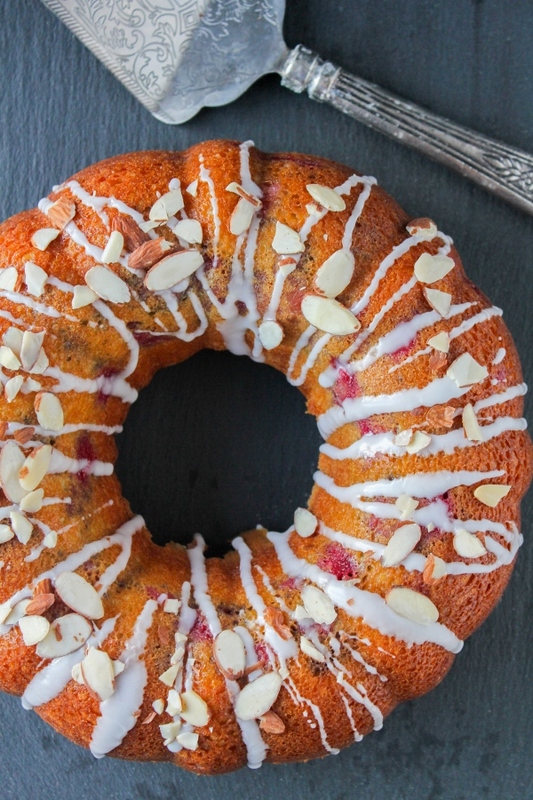 But since Mother's Day is this weekend, and since I really want to spoil my mom, I'm making myself this Cherry Almond Coffee Cake. I mean, her. I'm making her this coffee cake. Sorry about that. This coffee cake couldn't be simpler to make, but it's absolutely divine. Pure Almond Extract gives the batter the most intense flavor, and there are big tart cherries hidden inside. When you cut into the cake it's like finding a treasure! And the cake is so moist and tender, it's just incredible. 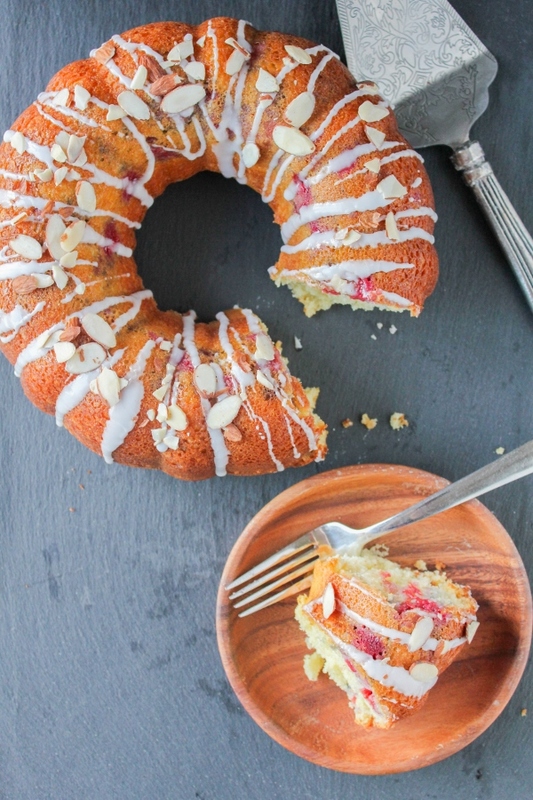 This beautiful coffee cake would be perfect on your Mother's Day brunch table. Really though it's great to make anytime, not just on special occasions. Try to have better self control than me though, will ya? Don't forget to enter the super fantastic giveaway below, and be sure to scroll down to see the other amazing #BrunchWeek recipes being shared today! Preheat the oven to 350 degrees. 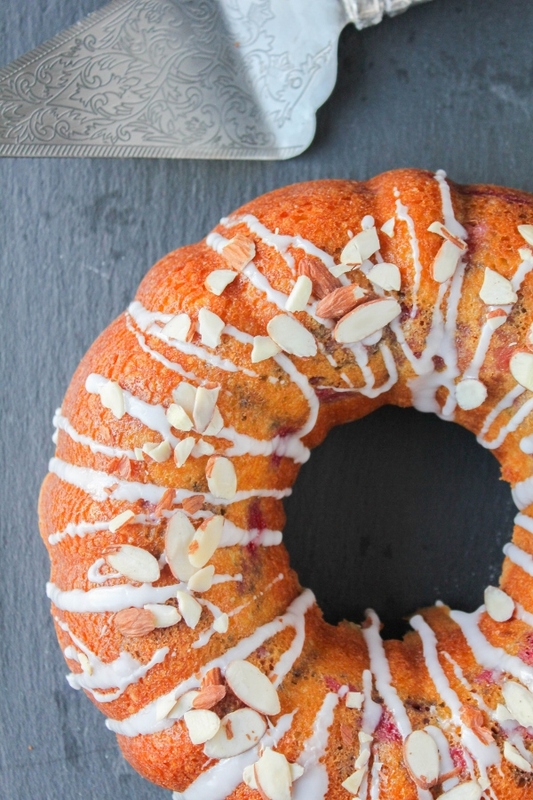 Spray a bundt pan generously with non-stick baking spray and set aside. In the bowl of a stand mixer, beat the butter and sugar until light and fluffy. Beat in the eggs, one at a time, then the milk and and almond extract, until everything is combined. In a medium bowl, whisk together the flour, baking powder, baking soda, and salt. Slowly add the dry ingredients to the mixer, mixing until just combined. Spoon half of the batter into the prepared pan. Sprinkle the cherries evenly over the batter, then carefully spread the remaining batter over the cherries. Bake the cake for 45-50 minutes, or until a cake tester inserted into the center of the cake comes out clean. Allow the cake to cool in the pan for 5 minutes, then turn it out of the pan onto a cooling rack. Allow the cake to cool slightly. To make the glaze, whisk all of the ingredients together until smooth. Drizzle the glaze over the cake and sprinkle with the almonds. Slice and serve.